High Pressure over southern Quebec allowed for light winds over northern New England, and fog and low stratus developed. The animation above shows the benefit of the fused product; when mid- and high-level clouds are present in the satellite field of view, the brightness temperature difference product loses the ability to detect fog and low stratus. Data from the Rapid Refresh Model will be used in these regions to produce an IFR Probability Field. Note how Burlington, VT, for example, reports IFR conditions. The brightness temperature difference product has only a small signal over Burlington, but IFR Probabilities are high. This entry was posted in AVHRR, New England on October 15, 2013 by Scott Lindstrom. Hourly imagery of GOES-R IFR Probabilities show the development of high probabilities in a region where low clouds and fog develop to cause IFR and near-IFR conditions in and around the lower Mississippi River Valley. The traditional method of detecting low stratus will be hampered by an abundance of high and mid-level clouds (as evidenced in the brightness temperature difference product, above, and in the day/night band imagery, below). Different polar-orbiting satellites can give snapshots at high spatial resolution that describe the fog/low cloud fields. The Suomi/NPP overpass at 0715 UTC (early in the night for radiation fog development), shows the abundance of high clouds over the western part of the domain, for example, that are illuminated by the setting half-moon. It is difficult to discern low clouds in regions where IFR probabilities are high. As above, but with Suomi/NPP Day/Night Band (Bottom Right), 0715 UTC. MODIS data are used to produce IFR probabilities, and those images are shown below. The later of the images matches the time of the Suomi/NPP band shown above. MODIS-based IFR probabilities are higher than GOES-based probabilities over the west-central part of Mississippi where satellite data are included in the predictors. This occurs when the MODIS-based satellite signal of low clouds is stronger than that from GOES, which difference in signal can occur because of the finer resolution of the MODIS data. In central Arkansas and northern Louisiana, however, where high clouds are present (and therefore where Satellite data are not used in the computation of the IFR Probability), the GOES-based and MODIS-based fields are nearly identical. AVHRR data (below) can also be used to compute brightness temperature differences, but those data are not yet incorporated into the GOES-R algorithms. However, the trend of the brightness temperature difference field can be used to monitor trends in low clouds/fog. High clouds will obscure the view, however. It is very difficult to infer a change in the amount of fog, and the concomitant decreases in visibility, based on the brightness temperature difference changes displayed below. As above, but with the AVHRR Brightness Temperature Difference (10.8 – 3.74), bottom right, at 0654 UTC, 0837 UTC and 1051 UTC on 19 July 2013. This entry was posted in AVHRR, Deep South, MODIS, Suomi/NPP on July 19, 2013 by Scott Lindstrom. Light winds allowed for the development of radiation fog over Florida early in the morning of Oct 18th, 2012, and the GOES-R IFR Probability fields matched the development of the fog, with probabilities increasing over the course of the night as IFR conditions became more and more widespread. The GOES-R IFR Probability product fuses satellite data with Rapid Refresh model output (as well as ancillary data such as SSTs and surface emissivity). An interesting aspect of this case is the development of a mid-level cloud deck — visible in the AVHRR brightness temperature difference field at 1031 UTC (and in the GOES-R cloud thickness product as well, from GOES) over the north-central part of the Florida Peninsula. A still image of the 10.7 micron field, below, plainly shows this mid-level feature. This region of mid-level clouds correlates well with a slight drop in the GOES-R IFR probabilities. 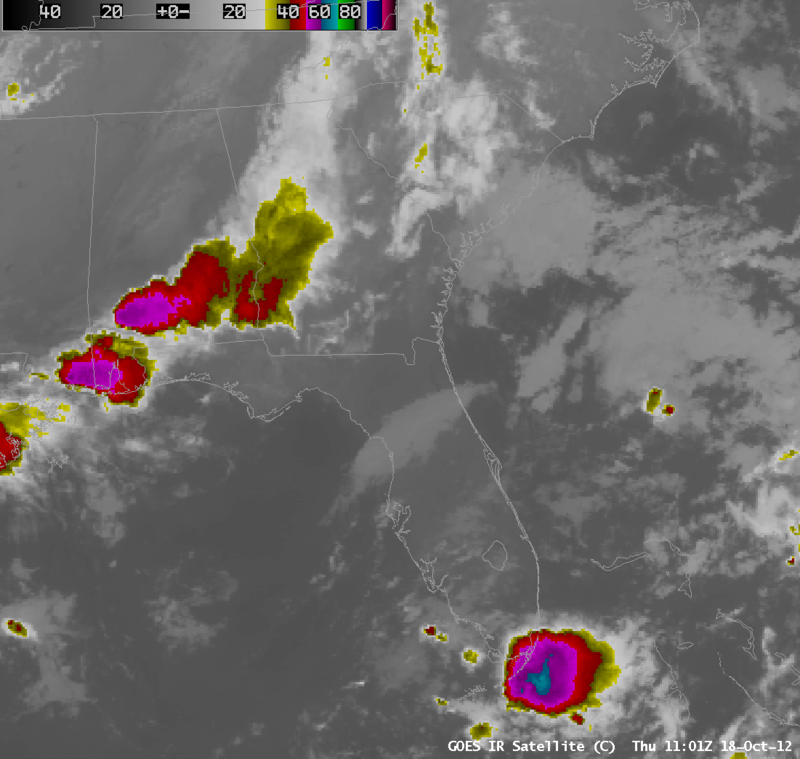 GOES-14 10.7 micron imagery, 1101 UTC. The Thickness of the lowest liquid cloud layer, upper right, can be correlated with fog dissipation time. The last image before twilight conditions, at 1115/1132 UTC, shows thicknesses peaking around 1000 ft. This corresponds to a dissipation time of at most 4 hours. Indeed, a visible image at 1415 UTC show that the fog has largely dissipated. The visibility at KJAX increases to 3 statute miles at 1419 UTC. This entry was posted in AVHRR, Cloud Thickness, Southeast on October 18, 2012 by Scott Lindstrom.